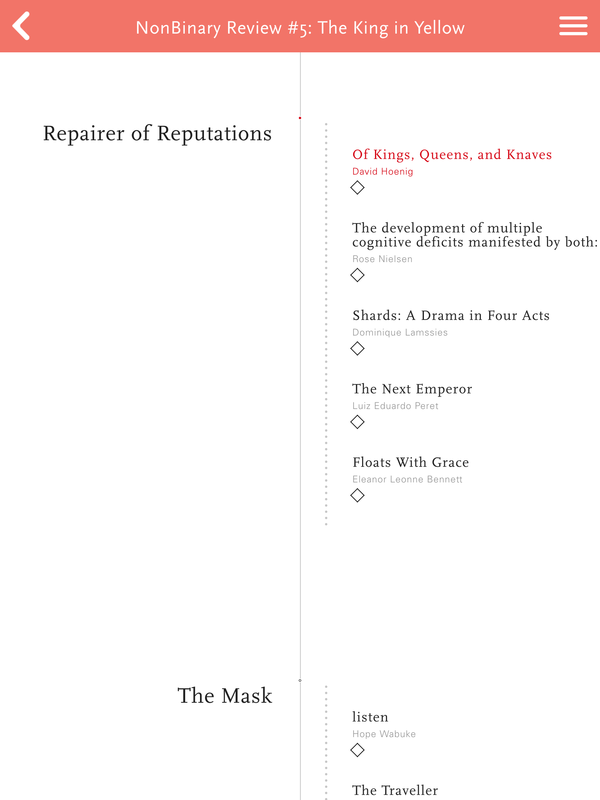 Lithomobilus is the first e-book platform that augments existing narrative forms and makes entirely new nonlinear narratives, without eliminating the things that make books wonderful. Our online writing software gives authors the power to expand upon their existing works, create new works with built-in expansion opportunities, and craft amazing nonlinear works. Currently the content includes five issues of the NonBinary Review, one issue of Unbound Octavo and a few standalone stories. 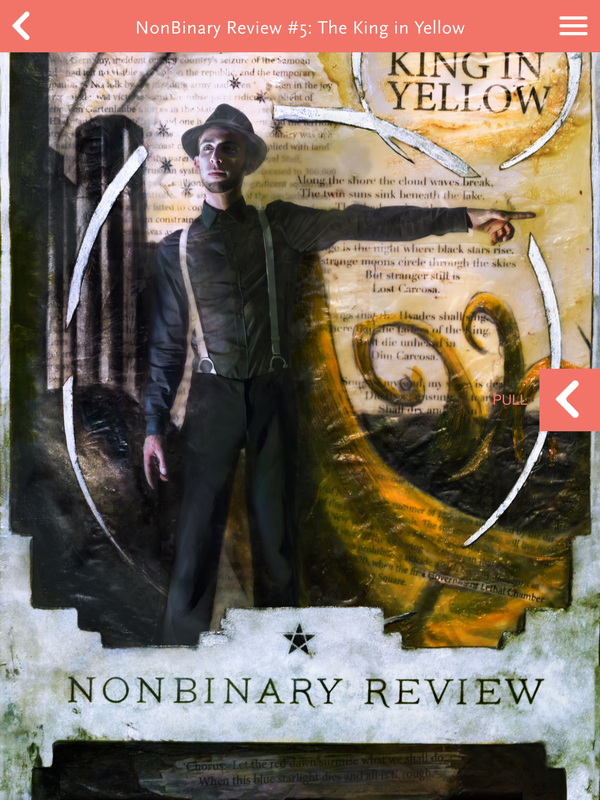 NonBinary Review takes existing, public domain work and sets it side by side with response material from current authors; so far these include The King in Yellow, Bulfinch’s Mythology: The Age of Fable, The Wonderful Wizard of Oz, Frankenstein, and Grimm’s Fairy Tales. Unbound Octavo contains three short prose pieces that, as far as I could tell, could have been presented in a standard ebook format with no loss of structure. When you are consumed by a story, you can never get enough. You want more characters, more details, more commentary, more of what makes that book addictive. The Lithomobilus e-book platform delivers it all without taking you away from your book. Which isn’t that far off from the pitch for the Coliloquy novel I covered last month, but Lithomobilus takes a different approach to the same challenge. The Lithomobilus advertising copy confuses form and content, suggesting that it is something about the app technology that will make it possible to read “more” about your favorite world. The formal features of the app are not groundbreaking: each work is presented as a table of contents from which the reader can choose to read a portion, much like reading an ordinary chapter from a book. In the NonBinary Review, there’s a distinction between primary works and spin-off works, with the primary chapters on the left and spin-offs on the right. I found the navigation fiddly, in fact, and often had to tap several times just in order to open a section. The app doesn’t provide any method of bookmarking which sections you’ve already read, in contrast with some other systems that encourage non-linear reading. (The standalone app for Iain Pears’ Arcadia does this, for instance.) Lithomobilus also offers even less information than a physical book would about the sections themselves: without page numbers or physical embodiment, you don’t know going in whether clicking a title is going to take you to an artwork, a single page of poetry, or a long story. Meanwhile, the task of providing “more” to readers is really not about form, but about creating and curating content. NonBinary Review is currently doing this — it is essentially a sequence of prose and poetry (and even art) anthologies on a series of themes. Making that good is a job of editing and publishing. In practice, I found the content provided in NonBinary Review mixed. Richard Lee Byers offers “Hate, Courage, and Blood,” a King in Yellow-universe story featuring the (real, historical) fencer Aldo Nadi facing off against Chambers’ sinister opponent; the premise is suitably creepy and the fencing descriptions are lovingly knowledgeable. David Hoenig’s “Of Kings, Queens, and Knaves” took Chambers’ universe and crossed it with a noir private detective story, with amusing if not especially deep results. Some of the other contributions worked less well for me: reaching for Chambers’ prose style and not achieving it, or riffing on the story of madness in ways that chiefly felt derivative or out of place in the 21st century. The samples I read from the other issues of NonBinary Review were similarly varied, but there was basically nothing here that couldn’t be done in some other form of anthology. One of the standalone stories in the Lithomobilus app does take things in a somewhat different direction: The Strangely-Browne Episode is by Lise Quintana, the designer of the app, which suggests to me that it might be meant as a prototype and example for other authors. It tells a four-part story about a dinner party gone wrong, with each part narrated from the viewpoint of four different characters (so there’s a total of sixteen segments). The table of contents approach lets you choose any order you like to read these, so you can read straight through from one character’s perspective or switch back and forth across a single episode. Essentially, this is a form that — more than most other interactive fiction — relies on the reader’s ability to remember and compare. Which details appeared in this version of the story, and which questions were left open? Was this bit of dialogue the same, or was it actually reported differently in someone else’s version of events? Barring a presentation that actually morphs one version of the text into another, these needs suggest a design in which the segments of text to compare are kept fairly short, and in which it is easy to navigate directly from one version to an alternate version of the same text. Snake Game sort of does this, though the sections are still longish for this purpose (and I remarked in my review of it that I found it was requiring a fair amount of attention to process). The Strangely-Browne Episode has even longer segments and requires more taps to move from one to another. It would be possible to reduce the friction here quite a bit — and if Lithomobilus is intended to support more works like this in the future, I think it might be worth adding some structure to do that. As for the content: Strangely-Browne tells a roughly school-of-Wodehouse story in which rich people with silly names behave badly at a dinner party. They all have reasons for their eccentric behavior, but since everyone acts a bit weird out of their own secret motives, we can only really piece it all together by reading the multiple viewpoint renditions. I enjoyed this to a point, though usually I had a pretty good idea of what was happening by the time I’d read 3/4 of the available narratives; then I would read the fourth in order to be thorough, and find that it didn’t add enough new to be compelling when I’d already seen the events three times. There’s a core problem of interactive fiction design here: if you design a narrative where the intention is that the reader will read as much as she’s curious about and then stop, but you don’t communicate that she’s allowed to do that, she’ll continue exploring the story space past the point where she’s started to feel bored and then blame the author for that boredom. This is genuinely not easy to resolve, and it’s at the heart of what Lithomobilus appears to be trying to do: to offer stories that aren’t consumed completely, but yield more and more content in response to a reader’s desire, inexhaustibly, never saying that your experience is complete. This entry was posted in ebooks, interactive fiction, mobile platforms and tagged lise quintana, lithomobilus, nonbinary review, plot mapping by Emily Short. Bookmark the permalink. Is the “craft amazing nonlinear works” just ad copy? Based on your review it seems to be a normal ebook interface. It does, doesn’t it? The left-vs-right juxtaposition of main text vs derivative text is the main difference here from a Kindle reader. From what I’ve been able to find online about Lithomobilus, I think that maybe behind the scenes there is some kind of content management system that would allow a publisher to associate new material with an existing text, and place it into the sequence after the fact; but even there I’m not sure. I also didn’t see anything that suggested the system could handle derivative-of-derivative material, where e.g. my piece of Marriage Law fanfic would be situated as derivative of an originating Marriage Law story that itself was tied to the original Harry Potter novel. Emily, there’s more to Lithomobilus than the current content is capable of showing. What’s up in iTunes right now is a beta, and we’re close to launching our V1. We’re in a bit of a chicken-and-egg problem – if nobody knows about the platform, nobody can write things that use its unique methods of presentation and navigation. I’d be happy to answer any questions you might have about the platform – email me at lise at lithomobilus dot com. FWIW, if you’re still tracking this thread: I did try emailing this address, and got a permanent delivery error back. But if you want to comment about what features we’re not yet seeing, please feel free.